Epson is updating its Home Cinema 1440 projector with the announcement of its new Epson Home Cinema 1450 1920x1200 projector. With a rating of 4200 lumens of color and white light, the 1450, like the 1440 before it, is best suited to use in ambient light. Though the Epson 1450 is positioned primarily as a home cinema projector, if I owned a sports bar or casual restaurant with big screen video I would be taking a close look at the 1450 for that use as well. And its 10 lb. weight means it is easily transportable for back yard movie night. The 1450 has a lower TCO than the 1440 due to (a) significantly extended lamp life and (b) reduced replacement lamp price. Lamp life in full power mode on the 1450 is 5000 hours compared to 3000 on the 1440, and up to 10,000 hours in eco mode compared to 4000 on the predecessor. We have not tested the Home Cinema 1450, but eco-mode typically reduces lumen output in the ballpark of about 25%, so it is likely that the 1450 will be able to put a solid 3000+ lumens on the screen even in eco mode. That much light will make it easy for many to take advantage of the 10,000 hour lamp life. So for many Epson 1450 users lamp replacement will be rare. But even when a new lamp is needed the lamp price is a paltry $99, down from $149 on the 1440, and much lower than many competing WUXGA high brightness models which currently run $300 and up. In the end, all of this means a lot of light for not a lot of money. Throw Distance. The Epson 1450's 1.6x zoom lens will let you fill a 150" diagonal 16:9 screen from a throw distance of about 17 to 28 feet. To see the throw distance needed to hit your screen, see the Epson 1450 Projection Calculator. Back yard movie nights. Summer is coming when a lot of folks like to set up movies in the back yard. The 1450 is ideal for this type of use -- at 10 lbs. it is very easily portable, the 16-watt onboard speaker gives you adequate audio, and it is bright enough to light up a 200" screen if you want to go that big. Inputs. 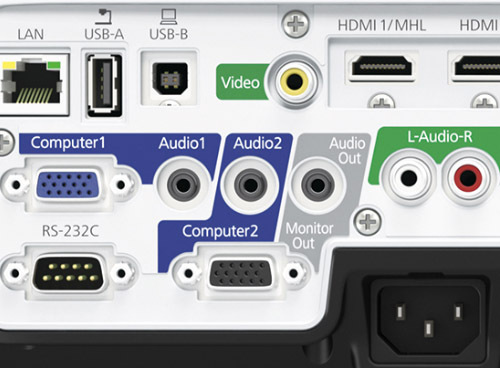 The 1450 offers computer input and monitor loop through, a composite video input, and two HDMI inputs including one which is MHL-compatible for mobile device support. Streaming HD signals from your Roku, Chromecast, or similar streaming device is simple. You can even watch simultaneous side-by-side images from two sources. As a side note, don't confuse the Home Cinema 1450 with the similarly named Epson BrightLink Pro 1450Ui, which is also WUXGA and an almost identical 4400 lumens. The 1450Ui, released last December, is an ultra-short throw interactive projector--a completely different animal. The Epson Home Cinema 1450 will be available from Epson authorized resellers and Epson direct on April 17.
what is the throw offset of this projector?? Landon, about 95% of the image is above the centerline of the lens. For exact details consult the user manual which is linked on the spec page. We link to almost all projector's user manuals via each model's spec page.